When Dr. Eli Zebooker was born, Woodrow Wilson was president, the Philadelphia Athletics had just won the World Series and, most shockingly, a Republican was mayor of Philadelphia. That was 102 years ago. 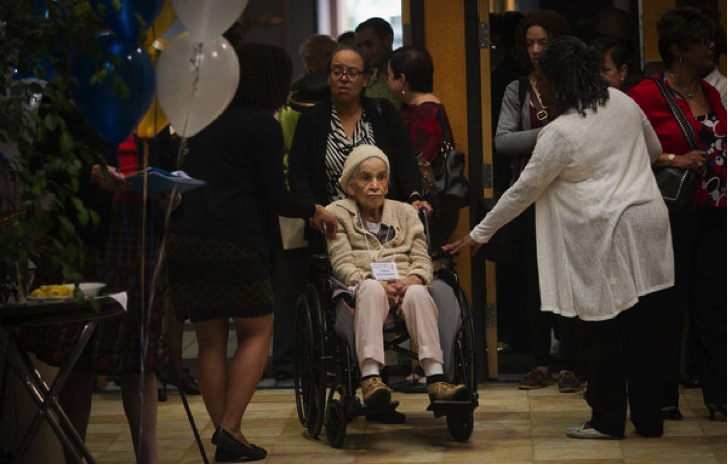 Zebooker – along with 89 other Philadelphians over the age of 100 – joined Mayor Nutter yesterday for the 15th annual Mayor’s Centenarians Celebration. The event, held at the Sheet Metal Workers Union Hall in South Philly, honored centenarians and their families. “Centenarians serve as outstanding role models of how we can make the most of our years with which we are blessed,” Nutter said in a speech to honorees. Of the many things seen over the course of a 100-year-old life, few can rival the grace and passion of a group of nursing-home residents twisting and turning to Robin Thicke’s hit song. Nutter said that he hopes to attend this ceremony as a participant himself one day. “But, I can wait,” he added. Philadelphia is home to 506 centenarians, one of the highest of all American cities. All persons turning 100 this year were invited to the event, which treated them and their families to a free meal. After lunch, the oldest woman in attendance, 108-year-old Fannie Mae Ausby, joined Zebooker, the oldest man there, in cutting a ceremonial birthday cake with Nutter. Zebooker, a practicing dentist, is still gregarious and vibrant. Sporting a bright, tan blazer, he greeted visitors with a kind words and a hug. Zebooker denied there being a secret to living long. “There’s no answer to that,” he said. When asked about his favorite memory over his 102 years, Zebooker nodded toward his daughter, Nina. “My daughter is my favorite memory,” he said. Those 99-year-olds waiting for their turn to be honored can expect an engaging ceremony with some interesting music choices. Maybe the line dancers can work on “All About That Bass” for next year.